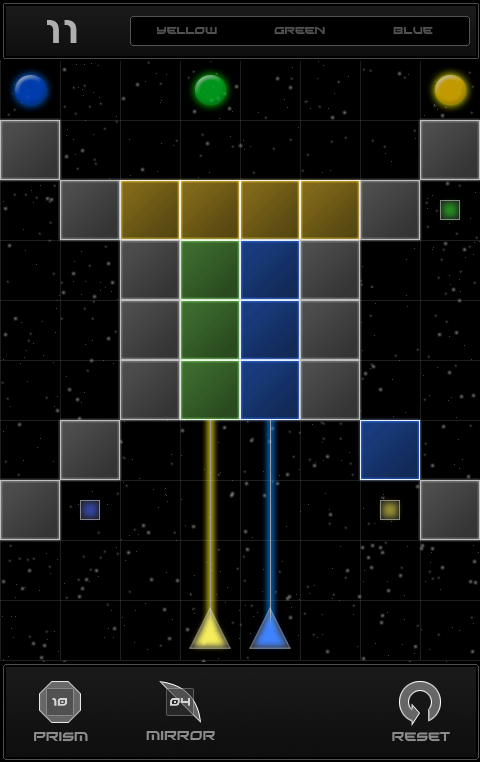 Recently, I’ve been playing Refraction on my Android phone. The goal is to get the colored light beams from the triangles to the round targets by placing mirrors and prisms on the board to manipulate the light. It’s a neat little game that has both good and bad physics which would be great for analysis. But we can save that for another post. Whoa. Where do I begin? I never “see” the full solution by simply looking at the puzzle. I don’t wait to make my moves until I know the solution. I take a few steps, and see where they lead. Sometimes those steps don’t work out. So I backtrack and try again. The forwards and backwards steps eventually add up to success. I know my students take the same approach when solving puzzles, whether it’s video games, mobile games, crosswords, or sudoku. They dive right in and tinker. So why, when faced with a physics problem, do many students suddenly freeze-up if they can’t see the whole solution right from the outset? How do we show students it’s OK to dive right in, go down blind alleys, hit deadends, backtrack, and try again? How do we eliminate problem-solving paralysis? This entry was posted in Uncategorized and tagged problem solving. Bookmark the permalink. Also available for iOS devices. Cool game, but some really bad circuit physics! Have you tried Launchball? I use decontextual (no content) activities often. These are things like black-box activities that are puzzles. Then I ask students to reflect on these puzzles & ask them how the puzzles are like science. 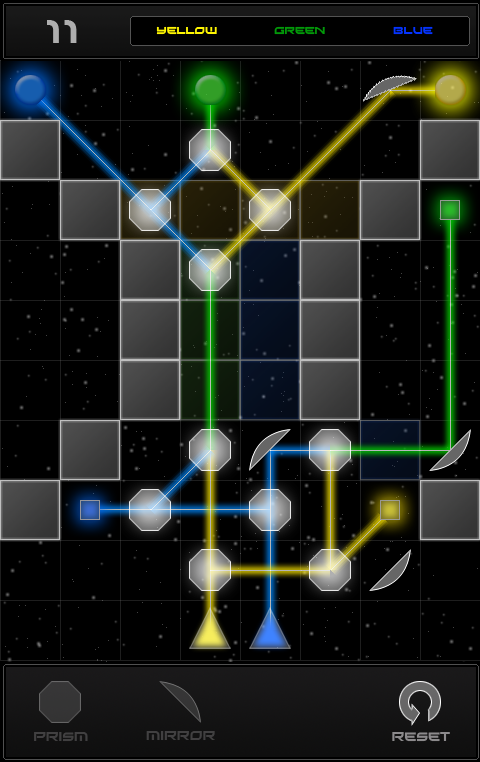 This last connection can be used/drawn upon when starting science conten puzzles (problems, investigations, etc). We have to get’em young! This summer I mentored a group of prospective teachers as they worked at a Sailing Camp; just last week we were watching one of their videos from their lesson, which involved creating a boat out of tin-foil. When the lesson was given to the younger kids at the camp – the 5-10 age group – they dived right in, trying all sorts of different shapes, but the older children waited, unsure what shapes to make – stuck deep in problem-solving paralysis! When they get older, they start to associate “doing the problem” with “writing down the right answer”. We need a way to convince them the Journey is just as awesome as the Destination, especially if there are multiple detours! *nod* I’ve had this conversation too. Sometimes my students and I talk about the “maze of confusion,” and how it’s dark in there, and slimy, and maybe you’ll never solve it, which makes you feel stupid, and maybe there isn’t a way out at all! On good days, we can talk about how maybe, if you step inside, you’ll be able to see the exit, or at least find a flashlight (you definitely can’t see the exit from outside the front door). So maybe silly visualizations help. Maybe they don’t. Other things I can think of: school is used to measure your smartness. Computer games are not. If you never finish a video game, noone will label you stupid. But if you try a school-thing and can’t do it, the consequences could be grave. (Stakes, or perceived stakes, are too high). I think there’s another substep in your process above: take a few steps, and see where they don’t lead. Trying something else is important, but trying something *better* is more important. I suspect that when your first experimental strategies don’t work, you pay special attention to the specific manner in which they didn’t work, and use that as information to make better inferences. I don’t think my students know how to do that, or realize they’re doing it, or realize it might help (in the same way that many don’t know how to analyze exactly what caused them to get an exercise wrong). I want to do some explicit work on inferences this year… I’m hoping it will help with this situation. I wonder if our students have ever seen us poke and shuffle and meander through a problem. I took pride in “performing” a clear, concise, smooth solution to the calculus problems I used to teach. They never saw me stumble or get lost and abandon an attempt – that would be a sign I wasn’t prepared. I wonder how we could authentically solve a new problem in front of them? Could the students make up a problem for us? Not every time, of course. We need *them* doing the solving, not us. But every now and then, it might not hurt to remind them how we actually solve a problem. Could be risky if they stump you! No one is grading them on their video gaming or crossword puzzles. And they get as many tries as they want. While I think the grading thing and fear of high stakes failure is a big part of it, I think another part is just that it’s easier to dive in to a physical puzzle or a video game where manipulating the problem is often done directly – by physically fitting pieces together or swiping your finger to move blocks on the screen. In the example of sudoku or logic puzzles, students have a simple way to “try” solutions – they plug in a few numbers or values and calculate whether they work. In physics it’s not so straightforward. What are the basic actions for manipulating a physics problem? When you’re experienced you know that you have to start by deciding what quantities matter, and that helps you choose laws to work with, which helps you set up equations, and then you can work on solving them. To make students better problem solvers, we have to focus on that toolbox of basic “things to try” when analyzing a physics situation or potential problem. Does that make sense or sound like the right track at least? I think a lot of times students are scared of failure. I think students are scared to even start trying to solve a problem because they are afraid that they will fail in the end. I also think that sometimes students get discouraged after they hit their first road block and are scared to try again.I feel that teachers should encourage students that it is alright to make a few mistakes because normally people do not solve problems exactly right the first time they try. Messing up is okay. If at first you do not succeed, try again. Hello, Frank Noschese, my name is Tyler Davis and I am a student in Dr. Strange’s EDM 310 class and I have been assigned to summarize your posts for my class on my blog. My link is bloghttp://davistyler310.blogspot.com/ and my class blog is http://edm310.blogspot.com. I believe that a lot of students freeze up on answering questions for Physics because they are scared of rejection. It’s kind of like a guy asking a girl out on a date when he isn’t sure she will say yes. One way that we could show students that its okay just to go with their gut instinct is by making them feel comfortable in the classroom. I know from personal experience that a lot of students scared not only of rejection, but also afraid of being thought of as “dumb”. I know that students do not like to be made fun of and they might be afraid to answer because of getting the answer wrong and being made fun of. Something teachers can do is just to reinforce the fact that its okay to get then answer wrong, but you just got to keep trying and never give up. If the solution path isn’t obvious, there’s a good chance it’s a trap or trick question. If that is the case, it suddenly becomes a massive time and effort sink, and there simply isn’t enough time for tinkering. Another aspect is the penalty involved. There’s no real penalty for playing and tinkering with a crossword puzzle. If one has to play and tinker with a physics problem, there’s still a good chance of getting an incorrect answer, and the time sink involved leaves even less time for other problems. Often, there is also no opportunity for backtracking. If a solution path is incorrect, the student doesn’t know until they see some red ink. And by then, it’s too late.